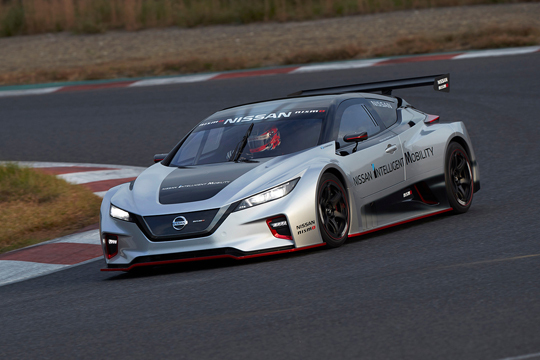 Tokyo—The all-new Nissan LEAF NISMO RC, an electric race car with more than double the maximum power and torque output of its predecessor, made its debut on Dec. 2 at the annual NISMO Festival at Fuji International Speedway, appearing alongside Nissan’s new Formula E electric race car. The Nissan LEAF NISMO RC will be on display at Formula E races and major shows and events around the world. All-wheel-drive zero-emission model shows off raw power and performance of Nissan’s electric vehicle technology. New all-wheel-drive system gives the LEAF NISMO RC its outstanding cornering prowess. Power is managed independently to each axle, instantly supplying torque to the tire with the most grip to let the car maneuver quickly and efficiently around the track. Similar to the previous model, chassis weight balance has been optimized by the midship location of the battery pack, with the electric motors and inverters ideally placed over the front and rear tires.